Magnetic measurements are the standard method for detection of unexploded ordnance in the subsurface. 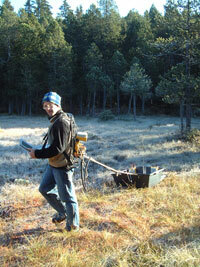 EXAMPLE: Magnetic survey over an area. Three anomalies show up. The right one was a shell, the two on the left happened to be shell splinters. Magnetic iron installations like fences, rail tracks and power lines above and below the subsurface often inhibit the use of magnetic measurements. In these cases, electromagnetic surveys and ground penetrating radar can be applied. In most cases, a combination of several methods is required to localize and identify the targets as well as possible, e.g. radar allows the depth and dimensions of objects to be assessed. 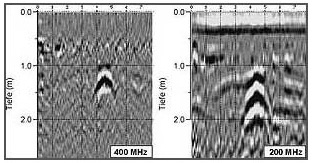 Ground penetrating radar shows a clear anomaly in a depth of 1m. A shell has been dug up.